Progress at Towns at Rouge Valley is moving along! 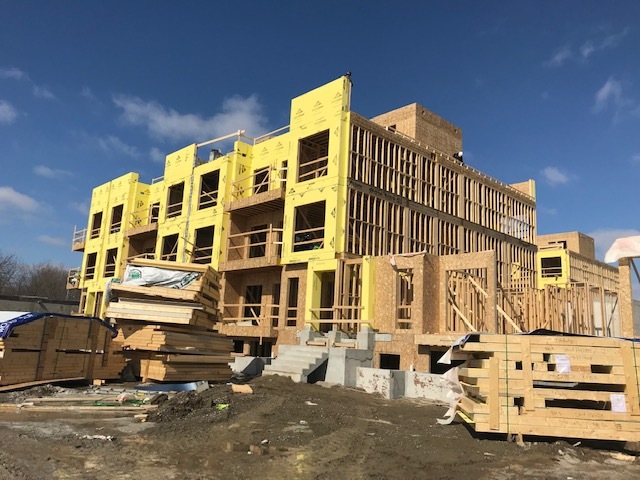 Between January 2019 - March 2019, Blocks 3 and 4 (East side) were fully framed, roofs were installed, and the electrical & mechanical rough-ins commenced and are nearly complete. Framing has also begun on Blocks 1, 2, 5, & 6 (West side). Block 3 & 4 - The exterior cladding (brick, stucco, and siding) as well as the remaining retaining walls on the east and south sides will be completed. Drywall, painting, flooring and kitchens will also have progressed to completion. Just in time for summer, the landscaping will also begin. Blocks 1, 2, 5 & 6 - The framing and interior walls will be fully completed with roofs and windows installed. Our teams will also complete the masonry by beginning of summer where .... Stucco will be begun on Blocks 1 and 5 and be completed on Blocks 2 & 6. The exterior facade of brick and stonework will also be complete towards the beginning of summer. Towns at Rouge Valley is where style meets function. These stylish townhomes were designed to let you get the most out of life. With all the prime features and amenities that the neighbourhood has to offer, life is what you make it at Rouge Valley. Whether you are you want to do a long nature hike at Rouge Park, workout at a world class facility like the Panam Centre, or meet up with friends for a fresh cup coffee at Lamanna's Bakery, there is something for everyone that is convenient and close to home. For more information on your current purchase or availability please contact our Presentation Centre.